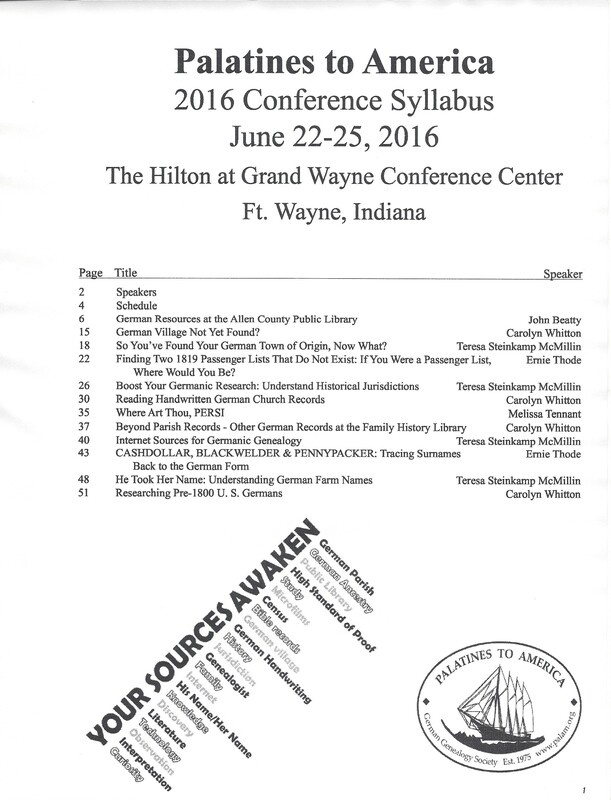 If you missed the 2016 National Conference in Fort Wayne Indiana, you missed a treasure trove of information and sources. The conference focused on German genealogy resources for locating your ancestors in both the United States and Europe. The Syllabus, which is now available for purchase, contains eight plus pages of selected German resources located at the Allen County Public Library, resources for finding your ancestor�s German village, resources for researching in another country, resources for passenger lists, ship lists, newspaper arrival lists, ship logs, departure lists, and more, resources for finding German historical jurisdictions in a given place, resources for reading German church records, online research of PERSI, resources at Family History Library for German Records other than parish records, resources for free online German indexes and materials, resources and information on tracing surnames back to the German form, resources for understanding German farm surnames, and resources for researching United States Germans who arrived prior to 1800.